I have been fascinated by handmade cards that espouse the theme of “Less is More”. Thus, as my 1st Valentine’s Day card and entry to LMGC Love & Romance Contest, I’m submitting a “Less is More Valentine” themed Card called “LOVE IS IN THE AIR” Card. The name of which will be explained under the instructions. Distress the edges of your card. Apply ink after passing the edges of your card under your distressing tool. Let the ink dry for a few minutes. Position the wave border strip sticker horizontally below the center of your card. Adhere your love heart embellishment on top of the border strip on left. Scatter and adhere your assorted stickers above your border strip. 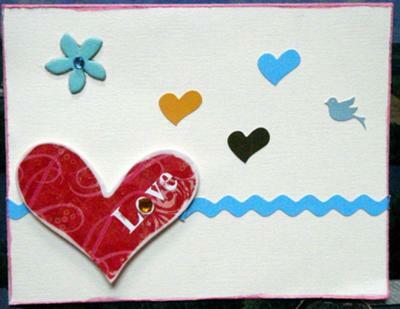 I chose hearts, flower and bird stickers to adhere on my card in keeping with the “Love is in the Air” card title. You can call me Kath. I'm not much of a cardmaker but I do enjoy making cards nevertheless. I'm more of a scrapper as you would see when you drop by my blog, Creo by Lady Katutz.